I’m a bit late in my post-op post due to my realization that I am not allowed to sit up straight for some time. I must remain in a hunched position while standing and at a 45° angle while laying down. The latter makes it difficult for me to sleep, thus the 1:30am posting from my phone. Preparation for my surgery started shortly after 6:00am. After a brief search for a suitable vein for my IV, I was covered with warm blankets and a “Bear Huggie” which distributed warm air all over my body. My doctor came in and sectioned off my soon to be gone parts with a purple marker before wheeling me in to the operating room promptly at 7:00. I was given a “margarita” injection and before I even had the chance to enjoy it, it was lights out. I awoke at around 11:30 and immediately felt pain in my upper abdomen. Not horrible pain, but definite discomfort. A nurse was close by and gave me Percocet as well as fentanyl in my IV. Needless to say, that pretty much took care of that. I snacked on a few saltines and ginger ale and before I knew it, it was time to go home. I had a momentary stint of nausea, but made it home vomit free. I am wrapped in what can best be described as a black sausage casing with a strategically placed opening. The casing is not to be removed for a few days which means no showers and no hair washing. My doctor called me around 3:00 and after I told her what I had been up to since arriving home, she informed me I wasn’t taking enough pain medication. Unfortunately, the Percocet is making me extremely nauseous and the best way to prevent that is to eat. I have forced down a bag a pretzels, two pudding cups, two jello cups and 1/2 a peanut butter and jelly sandwich. 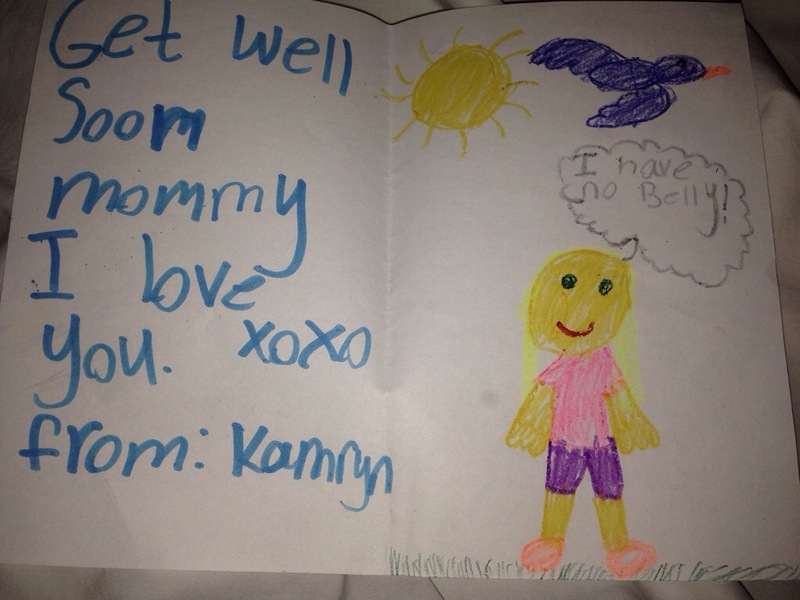 Kamryn and Rory made me get well cards and Kamryn may have a future at Hallmark. Overall, the pain isn’t that bad. It’s far less than previous surgeries I have had and I don’t anticipate needing to be on the pain meds for too long. My legs started hurting after I got up for the first time, but even that is fairly manageable. Tomorrow my doctor is making a house call to see how I’m doing and hopefully, I’ll get a glimpse at what’s under my black suit. And hopefully it’s a nice birthday present. Apologies for the choppy writing – I took a couple pain pills and flowing paragraphs are escaping me.